When people think of veterans, they often think of warriors, but Hurricane/Superstorm Sandy offers just the latest reminder of the significant humanitarian and often times life-saving work performed by our veterans on a daily basis. As Sandy was still wreaking devastation on the east coast, Air Force Reserve and Air National Guard members mobilized on the opposite coast – at March Air Reserve Base in California to trek nearly 3,000 miles to assist their fellow Americans. The Navy sent large-deck amphibious ships off the shores of New York and New Jersey, where Marines, soldiers and Coast Guardsmen were busy rescuing storm victims, rebuilding ravaged areas, and providing food and fuel. Memorial Day is appropriately set aside to honor our fallen war veterans – those who made the supreme sacrifice for this great country. Unfortunately, we are unable to personally show our appreciation to these heroes. 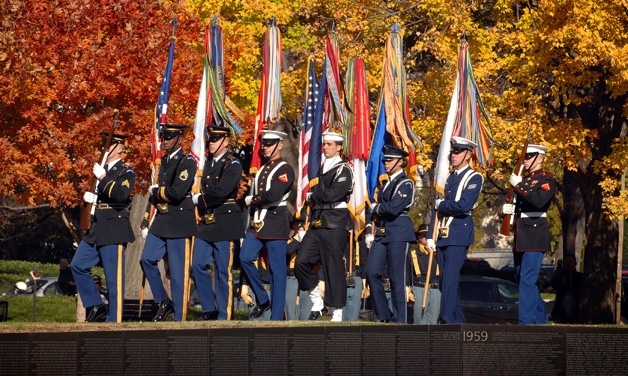 Veterans Day, however, is intended to honor all of our military veterans, including the nearly 23 million living men and women that are still among us. Sometimes all that is needed is a simple ‘thank you’ directed at the veteran or the family member for his or her sacrifice. Part of that sacrifice too often includes unemployment or underemployment when the veteran’s military service is over. Companies should understand that it’s smart business to hire veterans, and when members of the Guard and reserves deploy, it is America’s business to ensure that their civilian careers do not suffer. We must not forget the unique health-care needs of women veterans. There are more than 1.2 million women in America today who have worn the uniform. Women play a pivotal role in our mission in Afghanistan. The Department of Veterans Affairs must adequately treat breast and cervical cancer, as well as trauma that may have resulted from domestic violence, sexual harassment and assault. We must always remember those veterans who have given their lives for us long after they stopped wearing their military uniforms. While their service obligations may have expired, their love of country endured .Chances are that if you surveyed your local police or fire department, you would find that a disproportionately high amount of its members are veterans. Men like Navy veteran and Boston firefighter Paul J. Cahill, who sacrificed his life when a restaurant roof collapsed while he was fighting a fire in West Roxbury on Aug. 29, 2007. Or Washington State Trooper and U.S. Army veteran Tony Radulescu who was killed on Feb. 23, 2012, when he was shot during a traffic stop in Kitsap County. When an emergency hits, there is a good chance that it is a veteran that is first to respond. Whether it’s a school teacher, construction worker or first responder, military veterans take their missions seriously. On Sept. 12 of this year – 11 years and one day after the worst terrorist attack ever inflicted on American soil – two Navy SEAL veterans made the supreme sacrifice while protecting their fellow Americans who were under attack at the U.S. Embassy in Benghazi Libya. In addition to his grieving mother, Ty is survived by his wife, an infant daughter, two teenage sons and countless friends. And it’s important to remember not only the price that is paid by so many veterans to maintain our freedom – but the price paid by their heartbroken families as well. Scenes similar to what occurred in Winchester, Mass., have taken place in many other cities and towns across America. We revere these heroes because they revered us – their families, their neighbors, their fellow citizens. A country is only as good as the people in it. And a land that could produce such heroes is truly a land worth serving. While fewer than 10 percent of Americans can claim the honorable title “U.S. military veteran,” this special group often provides the vital services that enable our communities to function. Born of their extraordinary accomplishments comes our extraordinary debt. And for those accomplishments and for their dedication, we must always be grateful.